I am on my way to Savannah, Georgia to follow Hurricane Florence into the southeastern U.S. Our first stop will be the 5 a.m. Hurricane Hunter flight with the Air Force Reserve. The 10-hour flight will provide low level reconnaissance of Florence's exact location and intensity. The data from the Hurricane Hunters is critical. While we can estimate a storm's intensity from our satellites in space we are unable to get a true measure of a hurricane's strength over the ocean unless we fly a plane through the storm's eye. The Hurricane Hunters have been doing this for decades and they provide some of the most critical pieces of information to meteorologists when a hurricane is approaching land. 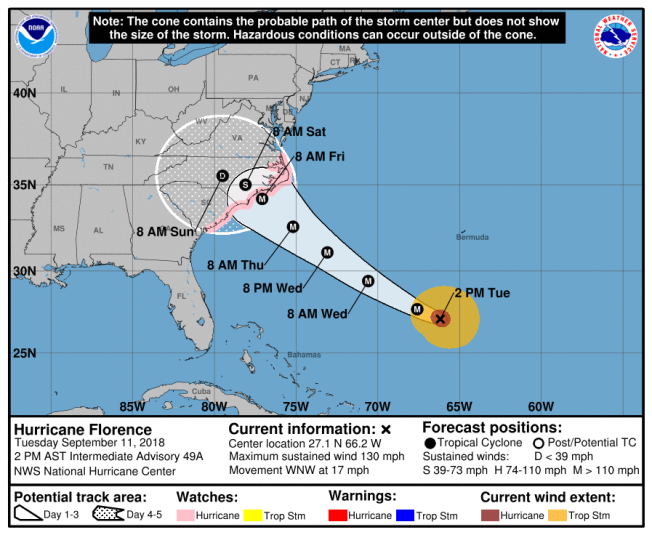 The track of Hurricane Florence remains uncertain. Our afternoon computer guidance shows a number of possibilities and none of them are particularly reassuring. 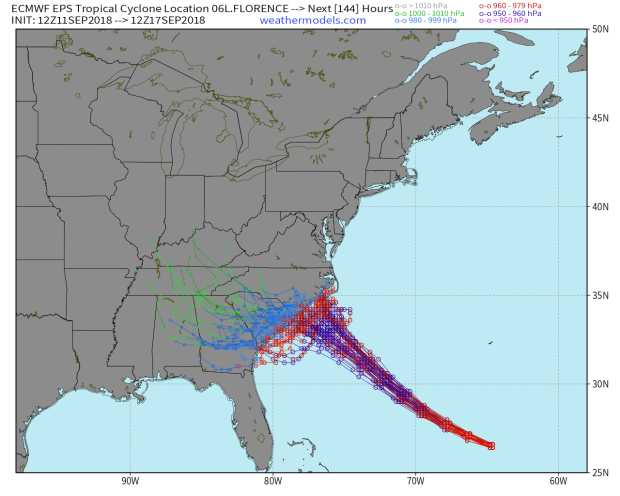 Most of our computer models bring Florence up to the southern tip of North Carolina where the storm stalls and then drifts back southwest toward South Carolina. This stall will allow Florence to drop a tremendous amount of rain inland and pound the coast with nearly a day of destructive winds and storm surge. There is a risk that the storm may stall far enough offshore to limit the wind and surge potential along the coast - at least somewhat - but I wouldn't count on that. The threat of damaging wind, rain, and surge now extends well south into South Carolina as well. We plan on riding out the storm in Wilmington, NC. We have a safe location and will be providing reports live from the storm starting on Thursday.